On Thursday, The Times released a statement saying that it knew about the tweets before hiring Ms. Jeong, 30, and that she would stay on the editorial board. Send an email to the New York Times! If the link above does not work please us the text below. Watching the Twitter feed today and watching Candace Owens get attacked while she was having breakfast was revolting. She was called a white supremacist, when in fact as you know, she is a Black woman who is standing up to the left. But this is the left these days, including your newspaper. This is the narrative pushed by the New York Times. 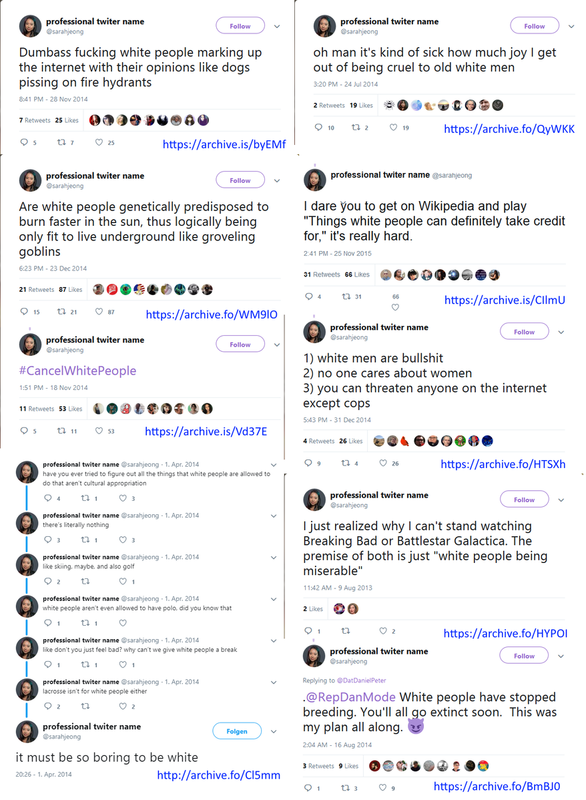 You recently hired Sarah Jeong to your editorial board and are sticking with her despite her tweets bashing white men. What is amazing about this rhetoric is that it is very racist. However, it now seems that it is okay to bash “whites,” and this is not racist. Here is the dictionary definition of racism: prejudice, discrimination, or antagonism directed against someone of a different race based on the belief that one's own race is superior and the belief that all members of each race possess characteristics or abilities specific to that race, especially so as to distinguish it as inferior or superior to another race or races. So now it appears that according to your newspaper’s editorial board, it is okay to push this narrative that white bashing is not racist, when according to the very definition of racism, antagonism against any race, is racist. Your hypocrisy is mind boggling. We are asking you to reconsider this Sarah Jeong’s appointment to your newspaper. Racism is racism, no matter what the color. How she could write editorials that would be accurate and not mirror this ideology that “white bashing” is appropriate is beyond the pale. She needs to go.